To enter additional classes, click the 'Add' button below. Download our 2018/19 booking form. Our programs can be delivered to students from Preschool to Grade 12. 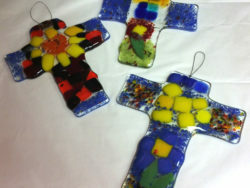 Each teacher pre-selects a hand built clay or fused glass curriculum based or seasonal projects. The curriculum projects have been designed in consultation with teachers and help to strengthen student learning by “bringing the curriculum to life”. We are also happy to create new projects that reinforce topics of study, please allow four weeks for project development. Our instructor comes to your school and delivers the class in your safe and secure facility. We provide all required clay, glass, student aprons, tools, trays, table drop cloth and supplies. Each class is 60 to 120 minutes in length, depending on the grade and projects that is selected. Classes are booked back to back, to accommodate as many as four clay classes, or six glass classes in one day. Clay classes begins with a pottery wheel demonstration and a 10 minute question and answer session about clay (where does clay come from, how do minerals in the ground affect the clay) and how clay is transformed into pottery (what happens to their projects after the class is complete). This is a wonderful opportunity to engage the students by sharing information. The students benefit from the pottery wheel demonstration as it settles them and focuses their attention. To younger students, the transformation of a “lump of clay” into a bowl or cup seems like magic. The older students want to try it themselves. This is a fun and relaxing way to end P.D. days. 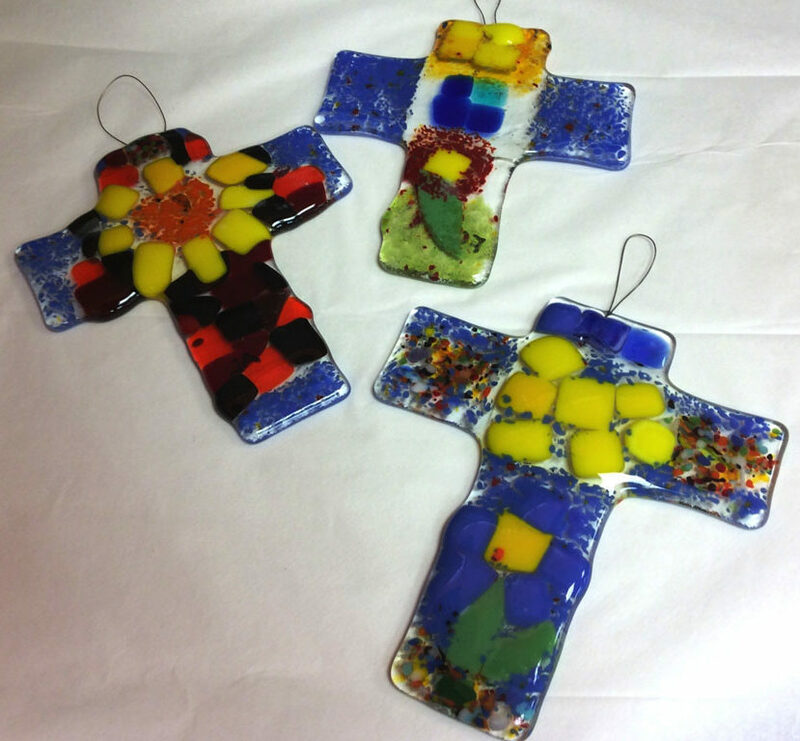 Sessions are 90 – 120 minutes and you may choose from fused glass, clay building, pottery wheel work. We will bring everything you need and do the clean up too! Prices start at $20 per participant. A booking confirmation form will be faxed or emailed to the teacher within 72 hours of making the booking. The confirmation should be checked to ensure that your requirements have been met. The form must be signed and faxed back to our office no later than 30 days prior to the date of the (first) class. All information in the booking confirmation form should be provided so that our instructors can prepare for the class. If some information (the selected project in particular) is not specified, then we will follow up to attempt to obtain this information. If it cannot be obtained by 7 calendar days prior to the class date, then we reserve the right to allow the instructor to select a project appropriate for that grade. Most of our regular Teachers find it best to select the project at the time of booking to avoid any future concerns. 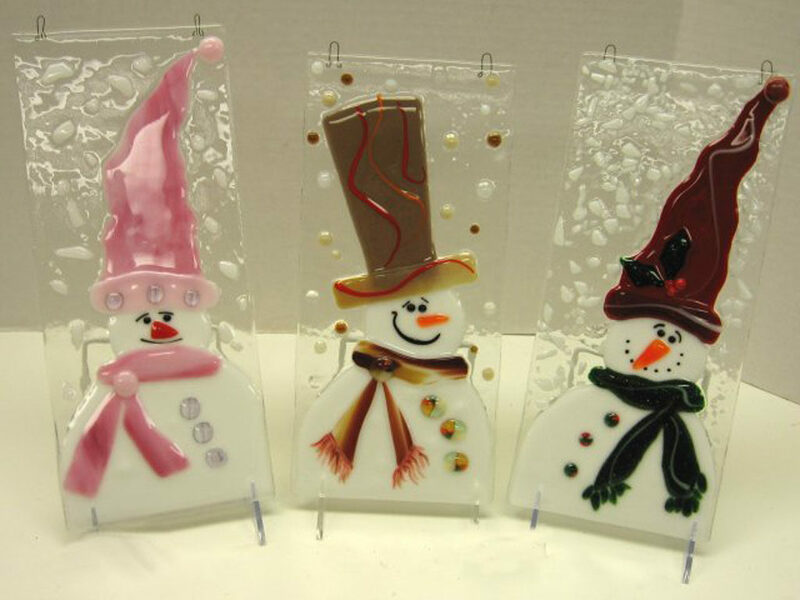 The glass material must be ordered, pre-cut and/or prepared prior to each fused glass class. Therefore, a 50% deposit will be required upon booking for all fused glass classes. A cancellation charge of $50.00 for a single class or $100 per day for multiple classes will be applicable for any classes that are cancelled within two weeks of the class date in order to compensate our instructors for lost wages. If the school is able to fill the cancelled classes, then no fee will be applicable. Note that you must speak directly to our program coordinator to cancel a class. Mileage charges will be applicable for schools located outside of the City limits and will be specified in the booking confirmation.. If some classes are cancelled and results in a sing le class per day in a school, then the cost will be adjusted accordingly. The invoice will be prepared after the class is completed and the instructor confirms that actual number of students and finishes that are purchased. The invoice will then be issued and will be due within 15 days of the invoice date. We accept payment by cheque, MasterCard and Visa. Direct deposit can also be arranged if desired. During snowstorms and other severe weather conditions, we may have to cancel a class with minimal prior notice as our instructor may not be able to drive to your school, arrive on time and/or transport her equipment from the parking lot to the school. Also, some students are often not in attendance on these days and teachers usually prefer to re-schedule the class to a normal school day when all students can participate. In these situations, we will notify your school as early as possible by telephone and email and attempt to contact the teacher directly by cellular telephone. Our program coordinators will then contact the teacher within the next few days to reschedule the class. We appreciate your understanding during these difficult situations. *How to prepare for Clay for Kids upcoming classes or residency. Please remind the children that clay pieces are very fragile and less handling is better. Use a glue gun for loosened decorations. 1) For an additional $5.00/student the projects can be slip glazed directly after making it. The projects will be dried, fired, dipped in clear glaze and fired to a hard and shiny finish. The project comes back to you completely finished. 2) Painted with metallic paints. 3) Painted with acrylic paint; for a shiner finish cover with paint on gloss varnish, gold or silver glitter or spray low odour Krylon. 4) If you chose to leave the clay project natural but you want it shiny you must use the paint on water soluble varnish. The spray Krylon will not work. For Christmas you can cover the varnish with glitter. When painting a three dimensional projects always paint the base first. 5) For complex projects such as Native Masks and Chinese Dragons, we recommend that the students first sketch the project on paper. This enables them to select colours by using felt pens or pencil crayons before working on the final clay piece. Note: Finishes, such as glitter or clear sprays, should be applied by an adult. Wrap projects carefully in paper and our Clay for Kids plastic bags to ensure they arrive home safely. Thank you for supporting us and please let us know if you have any questions. Gold and Silver Glitter Spray and Low Odour Clear Coat Spray for $12.00 each plus gst. Paint on water soluble Gloss Varnish (8 oz.) for $10.00 plus gst. This is the only thing you can use to make bisque ware shiny by itself or over tempera paint. 1. Q: Is Clay for Kids Edmonton locally owned? All Clay for Kids locations in Alberta are owned by Maureen Dennis who created the clay program for schools in Alberta in 1981. The Edmonton branch is operated and managed by staff located in Edmonton. 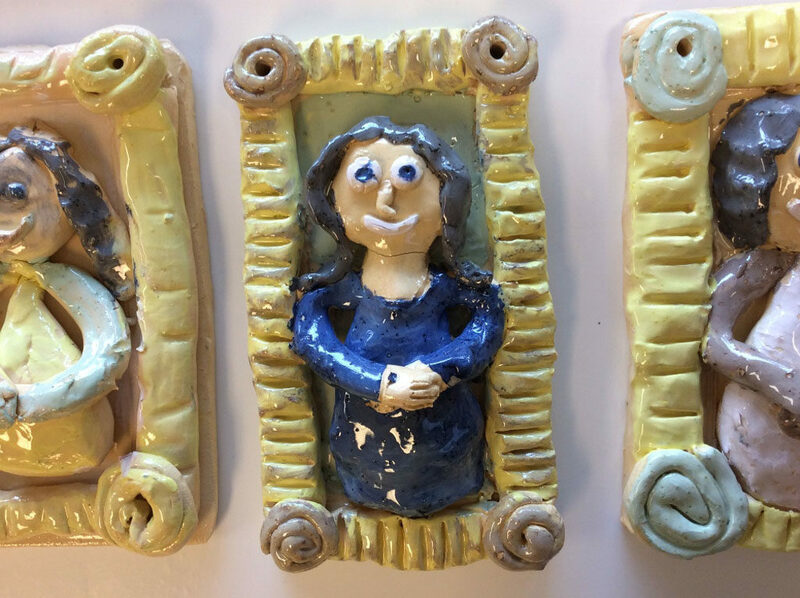 The staff in the Edmonton, Calgary and Red Deer branches work together to monitor the school curriculum and work with teachers to create new clay projects on an on-going basis. 2. Q: Does Clay for Kids Edmonton have all required business licenses and insurance? Clay for Kids Edmonton is licensed by the City of Edmonton and is a registered vendor with the Edmonton Public School Board. We have public liability and property damage insurance of $5,000,000 and all staff and instructors have full WCB coverage. All instructors also undergo a police security check. 3. Q: Do you come to our school? We created the “portable pottery program” in Alberta and have been coming to Edmonton schools since 2006. You don’t have to worry about arranging and paying for transportation, completing forms and bundling up your students on snowy days. 4. Q: What type of clay program does Clay for Kids provide? 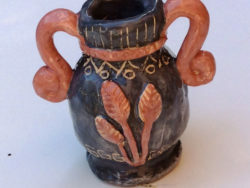 The Alberta Education curriculum for grades K to 6 specifies in numerous sections that children must have experience with “pottery programs”. If you do an internet search for pottery, you will discover that “pottery must be fired at a high enough temperature to mature the clay”. We adhere to these educational requirements and have been providing a true pottery learning experience to children in Alberta for over 30 years. We also provide “Paint & Go” classes in which the students paint & finish pre-fired bisque ware but inform the students that these products have been made from clay and pre-fired. 5. Q: What is an “air-dried clay” program? Some misinformation has recently been published about an “air dried clay program”. Clay projects must be first air dried to reduce their moisture content prior to firing to temperatures of over 1000 degrees C in a kiln. If the clay project is not fired, then it will have a “dusty surface” and will be easily breakable. More importantly, it will not be a piece of pottery. In addition, if you do an internet search on “air dried clay”, you will be referred to sites that sell clay modelling products such as Crayola clay, plasticine, paper clay, polymer clay and other “manufactured clay” products. These are all fun products that provide a convenient “clay-like experience” to children. However, these products are not used in a true pottery program. 6. Q: Why does an “air dried” clay program cost less? In our pottery program, the clay projects are placed in trays upon completion of the class, taken back to our studio, dried to reduce the moisture content, fired in our kilns to 1000 degrees C, carefully packed in boxes and then returned to the school within 21 days. The end result is that each student receives a piece of pottery that is suitable for glazing, acrylic painting or paint on varnish or gloss spray and is a permanent reminder of his/her learning experience. In an “air dried” program, the clay projects are not fired and the teacher is responsible for managing them upon completion of the class. The end product has a dusty surface and is easily breakable. We have been asked by teachers what an air dried program should cost. In view of the amount of additional work required for a true pottery class as described above, the “air dried” cost should be 60 to 70% of the cost of a true pottery program. 7. Q: Do you have curriculum based projects? 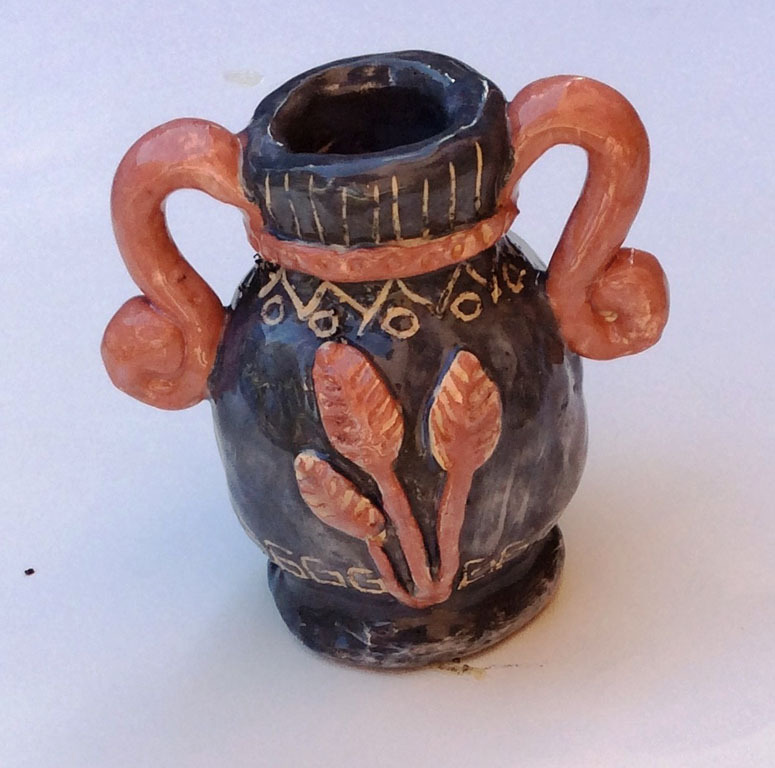 Clay for Kids has always been the first pottery program to work with teachers and create new curriculum projects. Projects like the Teepee, Iroquois Spirit Mask and Alberta Crest have been made in Alberta schools for the past 15 years. We introduced new Social Studies curriculum projects such as the Peruvian Child, Ukrainian Child and Dougga Dwelling for Grade three in 2010. A new Science project for Grade 6 called “The Seraph – a lesson in aerodynamics” has just been created. 8. Q: What projects are available? Can I request my own? Refer here for PHOTOS of our Curriculum and Art projects for schools and how they support the curriculum. New projects are created regularly in response to requests from teachers and evolve over time. Some of the best projects result from a teacher’s request when they are in a unit and need some support. 9. Q: Do you have a minimum class size and cost? We have a minimum cost of $200 for a class size of 18 or less. If you have a smaller class, then we can discuss the possibility of a combined class with another teacher to provide more cost effective pricing. Also, when we work with smaller rural schools, they may combine grades and classes to create a one day School Clay Event. 10. Q: What is the maximum class size? There is no firm maximum class size. If you have space for a large group, the students are Grade 3 and higher, you choose a simpler project, have some adult helpers and provide space for our instructor and pottery wheel demonstration, then we will try to meet your needs. This arrangement may not be ideal but we have worked in some pretty demanding situations and surprisingly it all works out well. 11. Q: Can you deliver Team Teaching classes? We strive to accommodate team teaching partners who want to combine their classes. However, the maximum class size depends on the grade and selected project. For example, we can manage as many as 54 grade five students to make wetland creatures and each student can still create a unique different creature. However, a class of 54 grade three students could not make the Taj Mahal project which is more involved. We will work with you to plan these combined classes but must ensure that we can give your students the time and attention needed to successfully complete their projects. Note that our clay curriculum based projects are more complex and take more time to make. 12. Q: How many classes can be delivered in a day? One of our instructors can deliver up to four classes in a school in one day. These could all be single classes for personalized learning. We can also deliver more classes by scheduling additional instructors in your school for the day. 13. Q: How long is a class? This depends on the age of the students. Our preschool classes are 60 minutes long due to the age of the children and our average clay class over preschool is 90 minutes. Combined age classes are 75 to 90 minutes long depending on range of ages. In these classes, we allow the younger children to read a book while the older students remain working. For our Artist in Residence program, the clay making and wheel throwing are 120 minutes long so that each student can make a clay curriculum project and throw a second clay piece on the pottery wheel. 14. Q: Do you teach preschool or special needs students? We have created specific projects and teaching methods for 3 & 4 year old children in Daycare and Out of School programs. If given support and encouragement, special needs students can create some of most imaginative clay pieces and we encourage teachers to give these students a Clay for Kids learning experience. We also offer a “paint ‘n go” option where you can select pre-fired bisque ware such as a piggy bank or cupcake bank for the students to paint. We will bring all of the required supplies including the table covers. Let us make it easy for you. 15. Q: Does your instruction allow for different aptitudes and creativity? Clay for Kids believes each child is an individual and that all projects are personal creations. We guide the students to successfully complete the project and encourage their imagination to shine through on every project. This is our approach for all instruction from a 3 year old preschool class to a Grade 12 Social Studies class creating a Personal Codex. We have retired school teachers on staff who willingly share their teaching skills with fellow instructors in order to improve the overall quality of our program. 16. Q: How do I book a class? You can book online on our website or email, phone or fax the office. We are normally in our office during week days. If you have to leave a message, then we will reply within 24 hours. 17. Q: Is my classroom suitable for instruction? Our pottery is safe, clean and can be delivered in any classroom. However, an art or activities room is best for the student learning experience. 18. Q: How far in advance should I make a booking? We have schools who regularly book a year in advance to ensure that they reserve their preferred time in our busiest months of November, December, March, April and May. We encourage pre-booking and make it easy for you! 19. Q: If we book multiple classes in one day, can they be delivered in each teacher’s classroom? Although we can move quickly and quietly from room to room, we prefer to set-up and deliver all of the classes in one room. At the end of each class, we place the student projects in trays to take back to our studio for firing. If we remain in one room, then there is less handling and moving of the finished pieces. We will have more time for instruction and the clean-up will be easier at the end of the day. Please ensure that the room arrangements are clearly understood when the classes are booked. 20. Q: What preparation is required prior to the class? Our program coordinator will email or fax a confirmation and procedures form to you at the time of booking to describe our set up needs. The main requirement is for a table, a nearby electrical outlet for the pottery wheel and floor space for the students to sit for our sharing time. 21. Q: What type of pottery wheel does Clay for Kids use? Since we began to deliver pottery classes in Alberta in 1981, we believed that a pottery wheel demonstration at the start of the class was critical to the student learning experience. We experimented with many types of commercial pottery wheels but none of them were rugged and durable enough for our instructor needs due to the travel from school to school. Therefore, we began to fabricate our own custom made pottery wheel in the late 1980’s and perfected it over the next 20 years. Our portable pottery wheels are constructed to heavy duty standards and have been approved by the Canadian Standards Association. Refer to our website for more information on our pottery wheels that are made RIGHT here in Alberta. For additional information on the pottery wheel, refer to Our Pottery Wheel. 22. Q: Can I buy one your pottery wheels for my own use? No. Our pottery wheels are manufactured for exclusive use by Clay for Kids. Because of the heavy duty construction and internal safety features, they are costly to fabricate. If you are a hobby or casual potter, we suggest that you instead purchase a commercial light duty pottery wheel from a reputable dealer. 23. Q: Are parent volunteers or other assistance required for the class? We recommend one adult for every 5 children for kindergarten classes. One parent volunteer per class for grades 1 to 6 is appreciated but optional. Teachers know if they have a student who needs extra help and will bring in assistance. For schools that do not have parent volunteers, grade six students or “school buddies” work well. 24. Q: What happens to the projects after the class is completed? In our presentation to the students, we explain that their clay projects will be taken to our studio, air dried to reduce the moisture content, fired in our kilns to a temperature of over 1000 degrees C and then returned to the school in approximately in 21 days. It is important for the students to understand this process for a true pottery program. The fired projects when returned are suitable for acrylic painting, varnishing or glazing. Once again, the firing of the clay is an essential component of a pottery learning experience for the students. 25. Q: When and how do you get paid? An invoice is faxed or emailed to the teachers two weeks before the classes are delivered to your school. Payment is due within 30 days. Cheque, Mastercard or Visa are available payment methods. 26. Q: What is your cancellation policy? If you have to cancel a booking, please notify us as soon as possible so we can try to reschedule you and open the date for another school on the waiting list. We realize that plans can change and will with you to resolve any scheduling problems. If you do not provide 48 hours notice, then a cancellation charge of $50.00 will be applicable. Please note that you must speak directly to our program coordinator to cancel a class. A notification by fax or email is not acceptable.